Stila Holiday 2015 Collection | Top Beauty Blog in the Philippines covering Makeup Reviews, Swatches, Skincare and More! STILA ETERNALLY YOURS LIQUID LIPSTICK SET ($39.00) (Limited Edition) - This exclusive set features six deluxe sizes—including two new shades—of the award-winning Stay All Day Liquid Lipstick. These lip colors offer full-coverage, creamy-matte color that holds tight for up to six hours. They deliver ultimate comfort and weightless feel, and their color-rich formula will not bleed or transfer. Enriched with vitamin E and avocado oil, these lipsticks soften your lips so they look and feel beautiful. STILA SENDING MY LOVE SET ($49.00) (Limited Edition) - The romance of a vintage love letter sealed with a kiss inspired this infinitely giftable set, uniquely presented to resemble an old-fashioned note card box. Filled with an irresistible collection including an eye shadow palette, a face palette, a deluxe Lip Glaze and a full size, best selling liner, this gift allows you to share the message of love this holiday season . . . one palette for you, one for your favorite girlfriend, or gift the entire set of cherished beauty essentials as the perfect expression of holiday cheer. 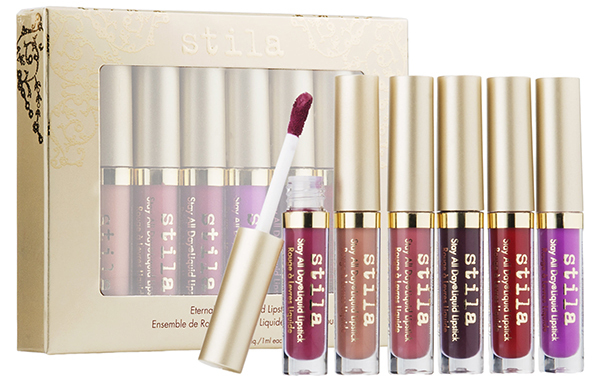 STILA ETERNAL LOVE LIQUID LIPSTICK SET ($20.00) (Limited Edition) - A perfectly portable mini-collection of Stila's award winning Stay All Day Liquid Lipstick! 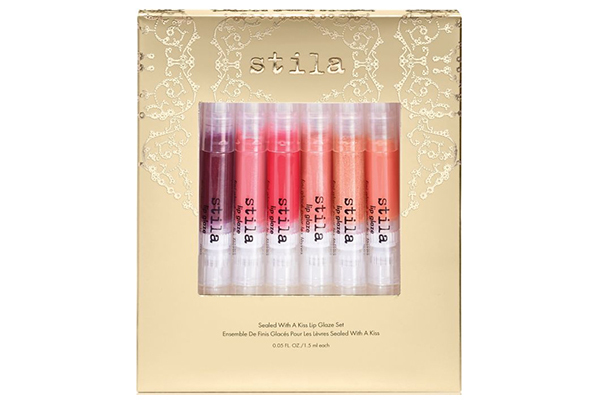 This deluxe size sampler features three shades from Stila's best-selling lip category that will bring the romance of the season to your favorite girl's lips. The original power pout! 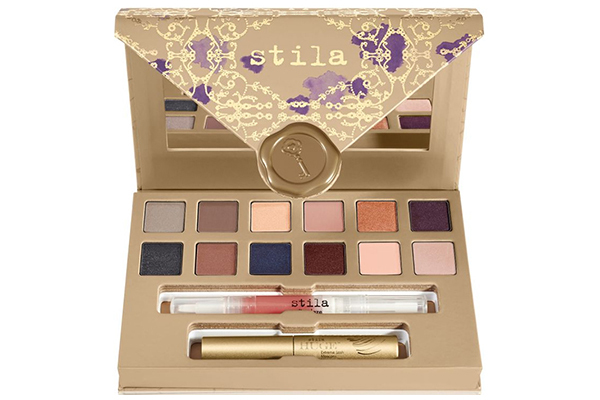 STILA TRUST IN LOVE GIFT SET ($40.00) (Limited Edition) - Nothing says love like a special delivery of romantic makeup essentials that take you from morning to midnight and anywhere you dare to dream. This must-have set includes expertly-selected shadows for eye looks from soft to sultry, Stila's new best seller Huge Extreme Lash Mascara for thick, flirty lashes, and a Deluxe Lip Glaze to make your lips mistletoe ready! The vintage-inspired packaging evokes the beauty of expressing messages from the heart and will make this collection as treasured as a love letter. 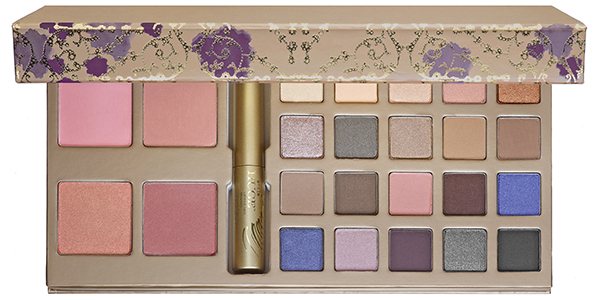 STILA A WHOLE LOT OF LOVE SET ($59.00) (Limited Edition) - Inspired by the classic romance of hand-written love letters, this A Whole Lot Of Love Gift Set features top-selling makeup for the eyes and face in one palette. It includes 20 color-rich matte, pearl, and shimmer eye shadows, four shades of universally flattering, silky-smooth blush, and a deluxe-size HUGE™ Extreme Lash Mascara for big, bold, ultra-black lashes. It comes wrapped in a vintage-inspired special delivery package that's perfect for gifting or keeping for yourself. What a beautiful collection! I love the palette! Oh It's so beautiful this collection! I always get so excited each year when makeup companies roll out their holiday giftsets. These are all super lovely and I am especially loving the Trust in Love gift set. Beautiful winter packaging all around for all of these products! Awesome collection, such gorgeous colors and shades. such a great beauty collection, thank you for sharing! Love holiday collections, the beautiful shades, packaging and not to mention all the bonus items you get at a great price. I like the colours of the palettes! Ugh they all look so good!! Beautiful colors, nice make up. OMG these sets look wonderful, love them !!! I need more Stila in my life ! Great produts for give the presents. These are stunning sets... Will def make great presents. Still a is a great brand! The lipstick set is superb for the price! 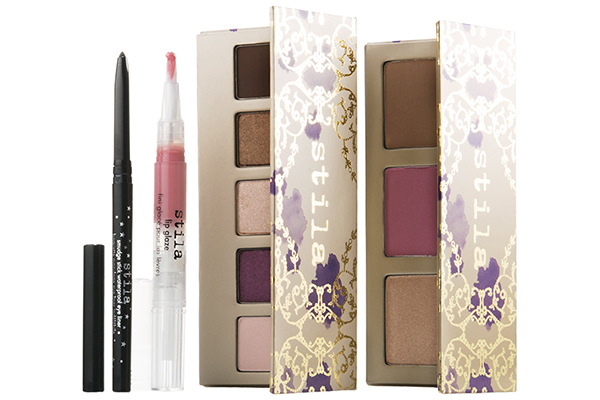 I love the stila brand, but what impressed me the most about this collection is the packaging! so festive and original!